With a helping hand from e-commerce giant Alibaba, China has succumbed to Peppa Pig fever. Following a recent agreement with STX, North American audiences will also get a taste of Chinese New Year swine fever. As the Chinese lunar new year of the pig approaches, there's no way to escape Peppa. Shopping malls, grocery stores, and restaurants around China are plastered with decorations bearing her image - despite Peppa being banned on social media last year for being too "gangster." It's not just Peppa. Sales of pig-shaped stuffed toys on e-commerce platform JD.com, a rival to Alibaba, grew 166 per cent month-on-month between December 13 to January 13, the company told Variety. That marks a 305 per cent increase year-on-year. The movie 'Peppa Pig Celebrates Chinese New Year' aims to ride that wave of obsession on to box office success. Produced by Entertainment One and Alibaba Pictures, the film investment and distribution arm of Alibaba, the movie received official Chinese co-production status back in August. It immediately bagged its place in the crowded February 5 release slot - the first day of Chinese New Year. While Peppa the film will face stiff competition at the box office, where it goes up against 12 other films opening the same day, including the similarly pig-themed animation The Legend of Pig Warrior and Boonie Bears: Blast Into the Past, the film's chances are rosy. Peppa Pig has recently become a video star on Alibaba's streaming video platform Youku. The Peppa character has been a hit in China since her show made landfall in the country in 2015. But it was in 2017 that she got her biggest boost - not from kindergarteners, but from ironic teens who made the character a symbol of self-mockery and rebellion. The pink pig became immensely popular with post-90s kids who identified with the "shehuiren," or "gangster," youth subculture, which was about wanting to sport a gangster look - think tattoos and gold chains - but not actually having the money to do it properly. To make fun of their own subculture, they took on decidedly un-gangster Peppa as their emblem, plastering themselves with fake Peppa tattoos, sporting toy Peppa watches, and remixing images and videos to make her, say, rock sunglasses, chains and a blunt. To combat the gangster viral trend, Douyin, China's version of TikTok, was last April made to delete more than 30,000 videos hashtagged #PeppaPig. "The popularity of Peppa Pig in China shows a spirit of innovation, but it could also bring negative influence to the young generation if they overindulge in such a subculture," the Global Times newspaper said at the time. Ahead of the Peppa movie's release, the beloved British character has once again gone viral. This time it is in a much more state-approved manner. Earlier this month, the film's director Zhang Dapeng released a five-minute, live-action promo that has brought viewers to tears, and worked up state media into a tizzy of praise. The adorable short, which essentially functions as a public service announcement for going home to see relatives during the new year, is perhaps one of the most successful examples of the localisation of foreign content in China in recent memory. It has been viewed more than 200 million times on Youku. "Tell Grandpa what you need [as a new year's gift] and I'll prepare it for you," an old man tells his grandson in a thick Shanxi accent from his broken mobile phone, while standing alone on a desolate hilltop to catch a signal. "Peppa? What's Peppa?" But the phone cuts out, sending grandpa on a goose chase to figure out what a "Peppa" is. 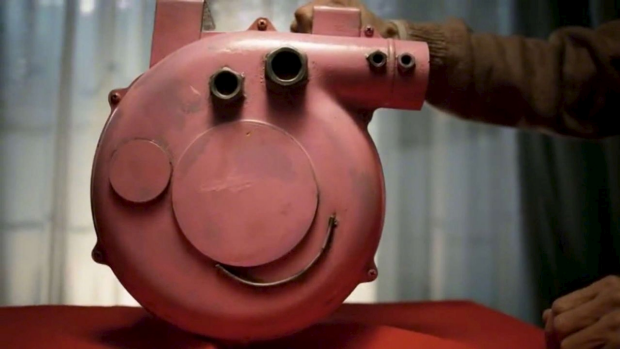 He tries looking it up in a dictionary, asking his village over the loudspeaker system, and hassling everyone he knows, before ultimately fashioning a gift out of an anthropomorphic metal fan painted pink to look like Peppa's face. It ends with the message, "On the first day of the new year don't accept gifts; instead go with the whole family into the city to watch Peppa." The short has been praised by no less than the ruling Communist party's highest anti-graft body, the Central Commission for Discipline Inspection and Supervision, and its official mouthpiece, the People's Daily. "It was the emotional resonance of this uniquely Chinese feeling [of longing for family reunion] that made this video a hit," the newspaper said. "As a cultural phenomenon, 'What is Peppa?' has brought a good beginning to 2019." Thanks to the short's success, California-based STX Entertainment announced on Thursday that it plans to release the Peppa film in 32 US markets. It will play in 65 theatres on the same day that it debuts in China, subtitled in English. Two new Chinese new year-themed special TV episodes of Peppa Pig will also hit the airwaves on February 5, Entertainment One announced on Monday. They will be aired by Nickelodeon and free-to-air broadcasters in regions including Australia, New Zealand, Europe, Canada, South Africa, playing in Mandarin in Asia, Taiwan and Hong Kong.